Q: Regarding the illegal entry of Indian border troops into China at the Sikkim section of the China-India boundary, why does the Chinese side believe that this incident is more serious in nature than before? A: The trespass of Indian border troops took place at the defined Sikkim section of the China-India boundary, which is different in nature from the previous frictions and standoffs between the two sides at the undefined sections of the China-India boundary. The Sikkim section of the China-India boundary has been defined by the Convention Between Great Britain and China Relating to Sikkim and Tibet (1890). The successive Indian governments have repeatedly confirmed that in written forms, recognizing that it concurs with China on the boundary alignment at the Sikkim section. The convention must be observed since this is a basic principle of international law. With its armed forces overstepping the defined boundary, the Indian side has breached the historical convention and gone against the UN Charter and the basic principles of international law. Thus, this incident is quite serious in nature. The Chinese side has repeatedly lodged solemn representations with the Indian side and required the Indian side to abide by the boundary convention, respect China's territorial integrity and immediately withdraw the Indian border troops back to the Indian side of the boundary. Q: Just now you said that the Sikkim section of the China-India boundary has been defined by the Convention Between Great Britain and China Relating to Sikkim and Tibet (1890). Can you elaborate on how the Sikkim section is delimited by the 1890 Convention? A: Convention Between Great Britain and China Relating to Sikkim and Tibet, which was formally signed between the Qing government of China and the Great Britain in 1890, explicitly stipulated the boundary between Xi Zang of China and Sikkim of the Great Britain. Since the founding of the People's Republic of China and the independence of India, successive governments of both sides have all recognized the effectiveness of the convention and repeatedly confirmed that in a series of official documents and talks. This convention is effective and binding for both China and India. The convention stated that the boundary at the Sikkim section commences at Mount Gipmochi in the east and follows the water-parting westwards to the point where it meets Nepal territory. If you go there, I am sure you can find where the water-parting is located easily. For a long time, the two sides have been exercising jurisdiction in accordance with this defined boundary. Abiding by this convention and the boundary defined according to it is the international obligation that must be fulfilled by the Indian government. Q: The talks between the US President and the ROK President were held in Washington D.C. last weekend. The two sides held discussions on such important issues as the Korean nuclear issue and the issue of THAAD. How does the Chinese side comment on the outcomes of the talks? A: We are also following closely the visit by ROK President Moon Jae-in to the United States. You said that the US and the ROK have exchanged views on the Korean Peninsula nuclear issue. We have always maintained that this issue can only be peacefully resolved through dialogue and consultation. The Chinese side welcomes communication between the US and the ROK who are major parties to this issue. Meanwhile, we have kept stressing that all parties, under such circumstances, should play their due roles, assume their due responsibilities and make concerted efforts to bring the Korean Peninsula nuclear issue back to the right track of peaceful settlement through dialogue and consultation at an early date. As for the issue of THAAD, China's position is quite clear-cut. We firmly oppose the deployment of the THAAD missile defense system in the ROK by the US and the ROK. Our position has not changed. Q: The launch of Long March-5 Y2 yesterday was unsuccessful. What is your response to that? 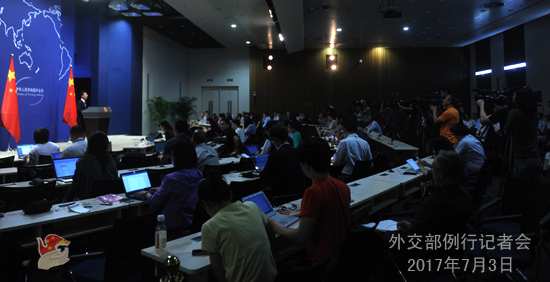 A: The media have covered a lot on the launch of Long March-5 Y2. To my knowledge, the Chinese competent authorities will ask experts to analyze what is going wrong with the launch. Q: Recently, the Indian side claimed that the Sikkim section of the China-India boundary is yet to be defined. What is your response to this? Does the Chinese side have any evidence to prove that the Indian side has once recognized that the Convention Between Great Britain and China Relating to Sikkim and Tibet (1890) has defined the boundary between Xi Zang of China and Sikkim? A: The Chinese side has stated many times that the Sikkim section of the China-India boundary was defined by the Convention Between Great Britain and China Relating to Sikkim and Tibet (1890). According to the documents between China and India, since the independence of India, the then Indian Prime Minister Jawaharlal Nehru, on behalf of the Indian government, explicitly recognized many times that the Convention has defined the boundary between Xi Zang of China and Sikkim. On March 22, 1959, in his letter to Premier Zhou Enlai, Prime Minister Nehru said "the boundary between Sikkim, the protectorate of India and Xi Zang, China was defined by the 1890 Convention and demarcated by the two sides on the ground in 1895". On September 26 of the same year, when writing back to Premier Zhou Enlai, Prime Minister Nehru unequivocally stated "the boundary between Sikkim and Xi Zang, China was defined by the 1890 Convention. This boundary was demarcated in 1895. There is no dispute over the boundary between Sikkim and Xi Zang, China". Current actions by the Indian side undoubtedly run counter to the Indian government's longstanding position. Q: In recent days, the US has taken a series of moves including arms sales to Taiwan, sanctions on Chinese individuals and entities and the US warship's entry into China's territorial waters off the Xisha Islands. We know that President Xi Jinping spoke to President Trump this morning, could you tell us whether President Xi made China's position on some of the issues clear to President Trump? A: This morning, President Xi Jinping had a telephone conversation with President Donald Trump as agreed. The Chinese side has issued a press release on this and you can refer to it on the website of the Foreign Ministry. During this conversation, the two sides have exchanged views on China-US relations, the upcoming G20 Summit in Hamburg and some other issues. President Xi pointed out that recently, the bilateral relations, while having achieved important progress, are also affected by some negative factors. The Chinese side has explicitly stated its positions to the United States. The two sides should stay committed to the general direction of the growth of China-US relations, uphold the principles of mutual respect and mutual benefit, focus on cooperation and properly handle and manage differences so as to promote the solid progress of China-US relations. Q: In the telephone conversation, did President Xi specifically referred to President Trump's remarks about China not doing enough on the DPRK issue? A:During the telephone conversation President Xi and President Trump have also talked about the peace and stability on the Korean Peninsula. The two leaders have exchanged views on the situation on the Korean Peninsula including the Korean Peninsula nuclear issue. I believe the US is quite clear about China's position on this issue. We have always called upon and urged the United States to play its due role, assume its due responsibilities and work with China for the settlement of the Korean Peninsula issue at an early date. Q: It is likely that the Chinese and US heads of state will meet on the sidelines of the G20 Summit in Hamburg, but it seems uncertain whether that will happen. At the summit China will look like a leader in the world as it is sticking to the Paris Agreement and has held a successful Belt and Road Forum for International Cooperation. President Trump, by contrast, is coming to the G20 Summit against series of domestic disagreements, pulling out the Paris Agreement. So does China hope to use G20 to further show the world that it is accepting its international obligations and the US perhaps looks bad in contrast? A: Regarding the meeting between President Xi and President Trump, during the telephone conversation this morning, the two leaders have agreed to meet on the sides of the G20 Summit in Hamburg and continue to exchange views on the issues of mutual concern. With regard to the G20 Summit mentioned by you, President Xi will attend this summit, expound China's views and proposals on current global economic situation and international economic cooperation and promote the policy coordination among relevant parties so as to jointly promote the robust, sustainable, balanced and inclusive growth of the global economy. Currently, the global economy is showing positive momentum of growth. Meanwhile, it is still confronted with some uncertainties. This Hamburg Summit is held against such kind of backdrop and it has attracted wide attention. The Chinese side supports Germany in holding a successful summit and we stands ready to work with all relevant parties including the host country Germany and the United States to step up cooperation to promote the positive outcomes of the Hamburg Summit. Specifically speaking, the Chinese side expects this summit to achieve the following four outcomes, namely, implementing the outcomes of the Hangzhou Summit, building an open world economy, jointly promoting innovative development and sending the positive signal of the solidarity and cooperation among the G20 members. Q: What do you think are the reasons for the recent frictions between China and the US? Does that mean the so-called "honeymoon period" of the China-US relations, namely, the relatively calm transitional period after the meeting at the Mar-a-Lago resort had ended? How will these incidents affect the politics and trade of the two countries, in particular the 100-Day Action Plan on China-US economic cooperation agreed by President Xi Jinping and President Trump? How will that bear on the meetings and talks? A: The "honeymoon period" between China and the United States you mentioned just now is an interpretation of the media. Officials from both the United States and China seemly have not employed this expression. Both China and the United States attach great importance to developing relations with each other. Both sides hold that this relationship has exceeded the bilateral scope because it is of great significance to the peace, stability, development and prosperity of the Asia-Pacific region and the world at large. As two major countries, it is inevitable that our bilateral relations will encounter problems from time to time. What counts the most is that both sides have the resolve and will to move forward the bilateral relations. The Chinese side is willing to work with the United States, on the basis of non-conflict, non-confrontation, mutual respect and win-win cooperation, to broaden consensus, deepen cooperation and properly handle and manage differences so as to move forward the China-US relations. Q: How do you comment on the entry of the US military destroyer into China's territorial waters off the Xisha Islands? Some Chinese media say that a war is not ruled out given the severity of the current stand-off between China and India. How do you comment on that? A: As for the entry of the US military destroyer into China's territorial waters off the Xisha Islands, last night the spokesperson of the Foreign Ministry has responded to that. I would like to reiterate it. On July 2, the missile destroyer USS Stethem trespassed China's territorial waters off the Xisha Islands. China dispatched military vessels and fighter planes in response to warn off the US vessel. The Xisha Islands are an inherent part of the Chinese territory. In accordance with the Law of the People's Republic of China on the Territorial Sea and the Contiguous Zone, the Chinese government promulgated the baseline of the territorial sea off the Xisha Islands in 1996. The relevant Chinese law has explicit provisions on foreign military vessels' entry into the territorial sea of China. Under the pretext of "freedom of navigation", the US side once again sent a military vessel into China's territorial waters off the Xisha Islands without China's approval. Its behavior has violated the Chinese law and relevant international law, infringed upon China's sovereignty, disrupted peace, security and order of the relevant waters and put in jeopardy the facilities and personnel on the Chinese islands, and thus constitutes a serious political and military provocation. The Chinese side is strongly dissatisfied with and firmly opposed to the relevant behavior of the US side. At present, with the concerted efforts of China and ASEAN countries, the situation in the South China Sea has cooled down and de-escalated and continued to take on a positive trend. The US, who deliberately stirs up troubles in the South China Sea, is running in the opposite direction from countries in the region who aspire for stability, cooperation and development. The Chinese side strongly urges the US side to immediately stop such kind of provocative operations that severely violate China's sovereignty and threaten China's security. The Chinese side will continue to take all necessary means to defend national sovereignty and security. 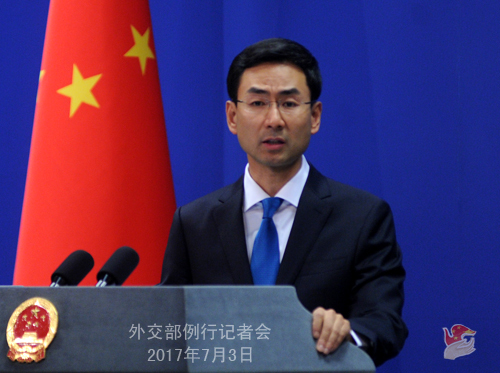 As for the illegal trespass into China's territory by the Indian troops, in principle, we won't comment on and respond to media's remarks regarding each and every incident. The Chinese government has made its stance clear time and again. We demand that the Indian side immediately pull back the troops back to its territory. The Chinese side will take all necessary measures to defend its national sovereignty. This is out of question. Q: First, India's Ministry of External Affairs on Friday released a long statement on recent developments in the Doklam area, which is different from what was told by China's Ministry of Foreign Affairs. The Statement said that India and China reached an understanding in 2012 that the boundary at the Sikkim section had not been finalized, and they reconfirmed their mutual agreement on the basis of the alignment. Further discussion on finalizing the boundary will take place under the Special Representatives framework. How do you respond to that? Second, Bhutan's Foreign Ministry also said that China had violated the Sino-Bhutanese Agreement on the Maintenance of Peace and Tranquility in the Border Areas (1998), accusing China of changing the status quo by constructing a road in the relevant area. I was just wondering if you have a response to that. A: On your first question, since the Indian troops illegally trespassed the boundary, the Chinese foreign ministry and defense ministry have stated China's solemn stance on many occasions and lodged solemn representations with the Indian side. The truth is very clear. The Sikkim section of the China-India boundary has been defined by the Convention Between Great Britain and China Relating to Sikkim and Tibet (1890), and the Doklam area is located on the Chinese side north and east of the eastern end of the Sikkim sector. The Indian troops crossed the mutually recognized boundary into China's territory and obstructed Chinese border garrisons' normal activities. India's act has violated the historical convention on the boundary, breached international law and the basic norms governing international relations and severely damaged peace and tranquility along the border. We demand that the Indian side pull back the troops that crossed the boundary and created necessary conditions for the recovery of peace and tranquility in relevant areas. As to the statement issued by India's Ministry of External Affairs last Friday, we have noted that this statement completely left out the Convention Between Great Britain and China Relating to Sikkim and Tibet (1890), none other than which clearly defined the China-India boundary alignment in areas where the incident happened. The agreement is a boundary convention jointly embraced by China and India, and the successive Indian administrations have confirmed it in writing on many occasions. As I just said, Prime Minister Nehru also confirmed this in his letters to Premier Zhou Enlai. The current Indian administration even dares not mention this convention. No matter how the Indian side tries to evade, observing convention is a basic principle of international law, and abiding by the boundary convention is an international obligation India must fulfill. At present, the Indian troops still illegally stay on China's territory and continuously infringe on China's territorial sovereignty. 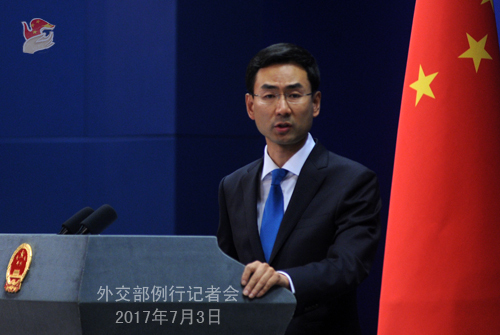 The Chinese side again demands that the Indian side bring back those border personnel who trespassed the boundary and conduct a thorough investigation into the case, respect the historical boundary convention and China's territorial sovereignty so as to uphold peace and tranquility in the Sikkim section of the China-India boundary. On your second question, we have stressed many times that it is an indisputable fact that Doklam has always been part of China's territory and under its effective jurisdiction. China and Bhutan have held 24 rounds of boundary negotiations since they launched such talks in the 1980s. Though the boundary is yet to be demarcated officially, the two sides have basic consensus on the situation on the ground in the border areas and the boundary alignment. There is no disagreement on the fact that Doklam belongs to China. China has strictly observed the mutual agreement between the two sides all along. The status quo of the boundary in the Doklam area is clear-cut and the area has always been under China's effective jurisdiction. There is no breach of agreement or damage to status quo by the Chinese side, which I believe is clear to the Bhutanese side. To conceal its illegal trespass, the Indian side has tried to distort the facts and even at the cost of Bhutan's independence and sovereignty in a bid to confound the right with the wrong, yet what it did is futile. China stands ready to work with the Bhutanese side to settle the boundary question through friendly negotiation without external interference and uphold peace and tranquility in the border areas. Q: Coming back to the phone call this morning, did President Xi Jinping specifically raise to President Trump the issue of the US destroyer entering the South China Sea? A: On the telephone conversation between the two state leaders, we have issued the news release. Q: The PLA spokesman's remarks about "historical lessons" the other day apparently referred to the 1962 war. The Indian Defence Minister has refuted the comments by saying that India of 2017 was different from what it was in 1962. He also said that the Bhutanese government has made the stance clear on China's attempt to alter the status quo in the relevant area. How do you respond to this? A: I just stated China's stance on what Bhutan has said. I should add that China has no objection to India's maintenance of normal bilateral relations with Bhutan. However, we firmly oppose India's attempt to justify its trespass on and invasion of China's territory under the pretext of "upholding Bhutan's interests". According to our information, the Indian troops trespassed the boundary and entered the Doklam area without notifying Bhutan. This is inconsistent with what the Indian side has said. The Indian Defence Minister's remarks are correct in some sense. India in 2017 is indeed different from what it was in 1962, just as China in 2017 is different from what it was in 1962. We once again demand that the Indian side observe the boundary convention, respect China's territorial sovereignty, and immediately bring the border garrisons back to the Indian side of the boundary. China will take all necessary measures to uphold its territorial sovereignty. 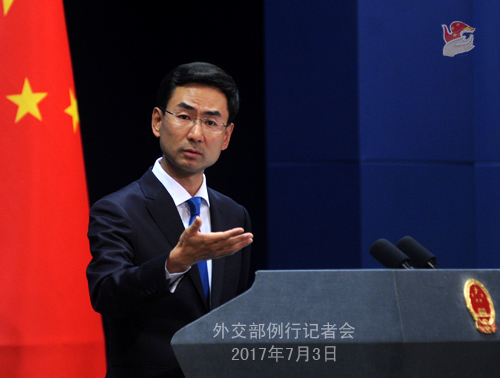 Q: Earlier, the Foreign Ministry has been saying that the diplomatic channels between China and India remain open. Are there any talks going on between the two countries? Is there any likelihood of a meeting between Chinese President Xi Jinping and Indian Prime Minister Modi on the sidelines of the G20 Summit? A: The Chinese side has lodged solemn representations with the Indian side in Beijing and Delhi at various levels following the illegal trespass by the Indian border troops. At present, the diplomatic channel between the two sides remain unimpeded. President Xi Jinping's bilateral meetings on the sidelines of the G20 Summit are still in arrangement. I have no information to offer at present. Q: Will the heads of state of China and the ROK hold a meeting in Hamburg? Some reports say they will meet in Berlin. A: Just as I said, President Xi Jinping's bilateral meetings on the sidelines of the G20 Summit are being arranged and coordinated. I have no information to offer at present. Q: China has canceled the officially-organized Indian pilgrims' visit to Xi Zang. Some reports also said that China has canceled a trip of Indian journalists to Xi Zang. There is also a section of the route to Xi Zang through Lipulekh that is still open. Some pilgrims have adjusted to go there already. Will China guarantee that those who have already applied to visit through the Nathu-la pass can go through the Lipulekh pass? A: I am not aware of what you said about Indian journalists' visit to Xi Zang. My colleague introduced relevant information on the officially-organized Indian pilgrims' visit to Xi Zang last week. For a long time, in the interests of China-India friendly relations, the Chinese side has made enormous efforts to facilitate Indian officially-organized pilgrims' trip to Xi Zang. The Chinese side approved the opening of the pilgrimage route via the Nathu-la pass in the Sikkim section of the China-India boundary for officially-organized Indian pilgrims in 2015. The arrangements ran well over the past two years, and the relevant department of China has previously made preparation for this year's reception. However, in the light of the trespass incident, the Chinese side has to suspend the relevant arrangements this year out of security consideration. As for when the pilgrimage route will reopen, it totally depends on whether and when the Indian side can correct its mistake. As for the other route for pilgrimage, according to my information, the officially-organized Indian pilgrims can still go on pilgrimage through the Byang-la pass in the undisputed area of the middle section of China-India boundary. Q: It is reported that China's aircraft carrier Liaoning entered Taiwan's Air Defense Identification Zone (ADIZ) on Saturday afternoon. Taiwan's military said it would continuously monitor the movements of Liaoning and launch responsive measures. Separately, reports from Japan say that a PLA naval ship entered Japanese territorial waters through the Tsugaru strait of Hokkaido yesterday, and the Japanese side has asked the Chinese warship to leave its territorial waters. What is China's comment on that? A: On your first question about the aircraft carrier Liaoning, the spokesperson of the Chinese Navy Liang Yang introduced relevant information on July 2. As approved by the Central Military Commission, the Chinese naval formation including aircraft carrier Liaoning, which is performing cross maneuver training tasks, will visit Hong Kong SAR in early July in celebration of the 20th anniversary of the People's Liberation Army (PLA) being stationed in HKSAR. As for what the Taiwanese side said about it, this is not a diplomatic question, thus should be referred to competent authorities. On your second question, I am not aware of what you said about Chinese naval ship entering Japan's territorial waters. I will refer you to the military if you are interested. I do like to emphasize that China's naval vessels operate in relevant waters in accordance with international law. Q: The 100-Day Action Plan on China-US economic cooperation was agreed by President Xi Jinping and President Trump in their meeting at the Mar-a-Lago resort. Have the talks in trade between the two countries been affected by the negative factors that bore on their relations over recent days? A: As we have stressed time and again, the China-US economic cooperation and trade is in essence mutually beneficial, bringing tangible benefits to the two countries and peoples over past decades. During their meeting at Mar-a-Lago, the two heads of state decided to establish four high-level dialogue mechanisms, one of which is the comprehensive economic dialogue. To my knowledge, the two sides are keeping communication on relevant arrangements under the mechanism. I believe both sides have the will to further promote our economic cooperation and trade so as to bring more benefits to the two peoples.